As high as possible. Why? It’s not the overall height, it’s the ability to see over other things. The biggest enemy of good reception is the “obstruction.” An obstruction is anything between you and the towers. TV broadcasts can go through almost anything but they tend to get weaker as they pass through things. It’s sort of like if you walk a mile through the air, it’s not so hard. But walk a mile through a lake or pond and it’s very hard, and you get weaker as you push to make it through the water. Putting an antenna on a high mast means that it has a clearer view of the sky and of the broadcast towers it’s trying to reach. That doesn’t mean the antenna wouldn’t work well down on ground level, but if you’re trying to reach those distant stations, you’ll want to get the antenna up nice and high. Often times strapping it to the chimney will do the trick but sometimes extreme measures are needed. 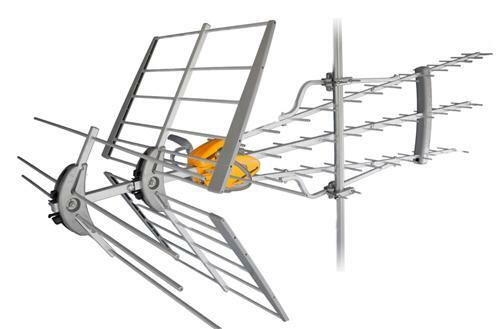 Luckily Solid Signal has you covered with a wide variety of mounting supplies that can help you get a clear signal from as far as 100 miles away for TV, even further for radio. We even stock custom tower equipment for when you’re really, really serious.